Home » »Unlabelled » Prayer over loudspeakers banned at HS football games. Watch how players from both teams react. Prayer over loudspeakers banned at HS football games. Watch how players from both teams react. All it took was one person’s complaint. 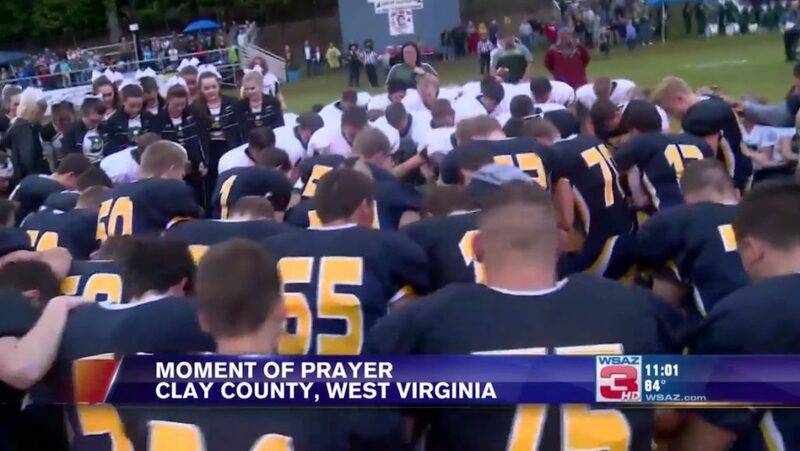 Toward the end of last year’s football season at West Virginia’s Clay County High School, someone apparently didn’t like the tradition of a prayer said over the loudspeakers before games — and told the school board so. With that, the district decided that a moment of silence would be observed instead. And the Sept. 1 game between Clay County High School and Braxton County High School marked the first time the ban on prayer over the loudspeakers was in effect, the station said. Of course, if students decide they want to pray, that’s a totally different story. And that’s exactly what players — from both teams — had in mind. When the moment of silence was announced, the opposing teams rushed to the center of the field, took a knee and prayed aloud, joined by many in the bleachers, WSAZ said.